In today’s competitive sporting environment, children are being placed under increasing pressure to excel at their sport. Schools and clubs (not to mention parents) invest a lot of time and money developing their children into athletes, and it is quite common for youngsters to be exercising in excess of 20 hours per week! Due to the structure of growing bones, injuries in children differ from those of their adult counterparts. 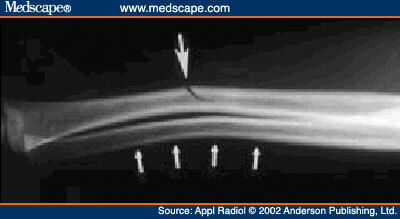 For example, due to the “elastic” nature of long bones in children, these bones tend to “bend” and split rather than break, resulting in what is known as a Greenstick fracture (see above). 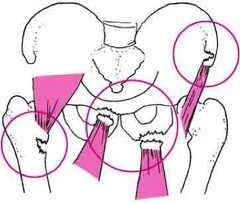 The end-plates of long bones (where the growth occurs) are susceptible to “shifting” under large loads or fractures, which given their location, often affects the overall growth of these bones. Where an adult might develop a tendon problem with overuse, children are more likely to develop a traction apophysitis, whereby the bony attachment point of the tendon is “pulled’ away from the bone. This usually occurs at the attachment site of large, powerful muscles such as: the elbow (Panner’s Lesion), the Hip, the knee (Osgood-Schlatter’s Lesion and Sinding-Larsen-Johansson Lesion) and the Ankle (Sever’s Lesion). These injuries are usually due to the repetitive nature of some of the sports that children play (think about how many times a young, fast pitcher, will practice his throwing action) leading to repetitive stress of specific tissues. We commonly see shoulder and elbow overuse injuries in throwing sports (cricket, baseball, water polo etc), stress fractures of the spine (e.g. tennis, athletics) and stress fractures of the lower legs (runners and dancers). The wonder drug called exercise! Unfortunately there is no pill that can do all these (wishful thinking), but there is a drug out there that can, and it’s called Exercise!! I recently attended a course by the “Exercise is Medicine” institute to discuss this very topic of EXERCISE being prescribed as a MEDICINE to all people. It’s part of a global initiative of the American College of Sports Medicine to promote exercise in a safe and effective way. As with most of the population, most of my patients are aware of the importance of exercise. Those that don’t exercise regularly will always sheepishly admit that they know they should be exercising, but usually blame a lack of time or tiredness as their reason for not doing so. Not exercising for ONE day has the same health detriments as smoking THREE cigarettes!!! As a non-smoker who chooses not to smoke due to the health implications, this came as a big surprise to me and puts into perspective just how damaging it is to be physically inactive. Thats right! Just because you are not overweight doesn’t mean you are healthy. If you are not doing at least 150 minutes of exercise per week, you are considered high risk for developing a variety of health issues!! That basically boils down to getting 30 minutes of exercise for 5 days per week. Less than that and you chances of mortality are more than someone who is obese, or smokes, or has diabetes. Being physically active during the day does not count as EXERCISE. A lot of people believe that they get enough “exercise” by being on their feet all day or climbing a few flights of stairs during their day. The truth is, if your heart rate is not reaching between 50-70% of its maximum capacity for a minimum of 30 minutes (continuously) per day, you can’t say you are exercising. Work that out quickly for yourself- take 220 and minus your age to get a rough idea of your Heart Rate (HR) max. Then take your number, and multiply it by 0.5 to get 50% and 0.7 to get 70%. So this guy or girl would need to have their HR at between 92.5 and 129.5 beats per minute for 30 minutes a day. On average, a brisk walk would get you into this target heart rate but as with all DRUGS, there are certain risk factors (especially for people who already have pre-existing medical conditions) so this is where Exercise is Medicine South are working with health professionals in order to safely and efficiently prescribe exercise to individuals. After an initial screening procedure, you would be grouped into either low, moderate or high risk, and your exercise program specifically tailored to suit your risk and needs. There are 1440 minutes in a day. Can you really not find the time to use 30 of them towards living a longer life?? ?